Zoom meetings and webinars that are on the user’s calendar can be reflected on the Zoom client with a join button and host information, providing an easy way to join the meeting. If a meeting join link is not detected, the meeting will not display. 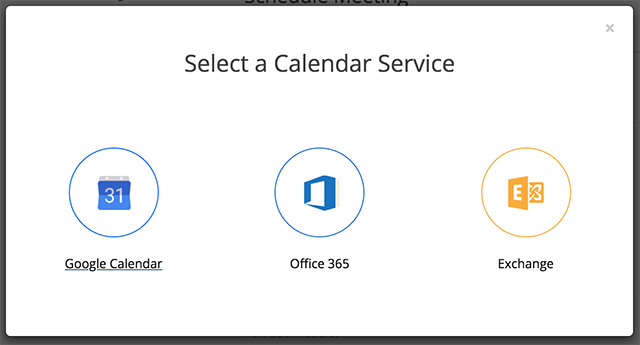 The calendar integration is compatible with Google Calendar, Office 365, and Exchange. On the Zoom Desktop Client, click Meetings. This will open your Zoom web portal in your default web browser. If you are logged into multiple Google accounts, click the one you would like to integrate. Click Allow to provide Zoom access to your Google calendar. The My Meeting Settings will now show your integrated calendar. You will need to signout of your desktop client and sign in again for the integration to take effect. This will open the Office 365 settings page. Office 365 account email address: Enter the email address associated with your Office 365 account. EWS URL: This will be populated with the default EWS URL for Office 365. You can leave this as the default unless your Office 365 account uses a unique configuration. This will open the Exchange settings page. 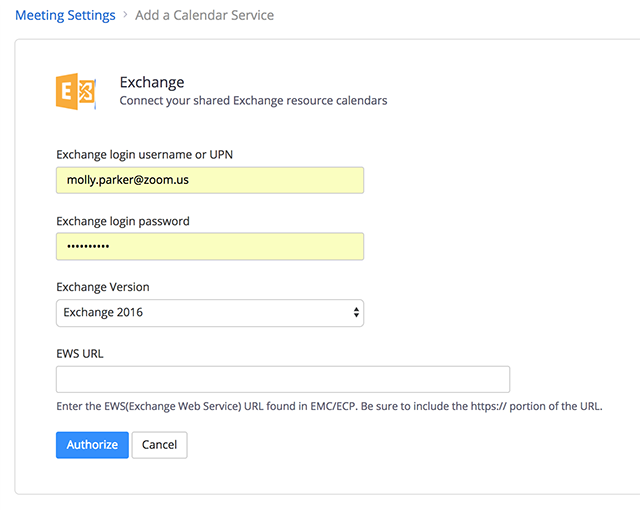 Exchange login username or UPN: Enter the username or UPN associated with your Exchange account. Exchange login password: Enter the password associated with Exchange account. Exchange Version: Select the version of Exchange. If you are uncertain of the Exchange Version, please contact your internal IT team for more information. EWS URL: Enter your organization’s EWS URL. If you are uncertain of the EWS URL, please contact your internal IT team for more information. 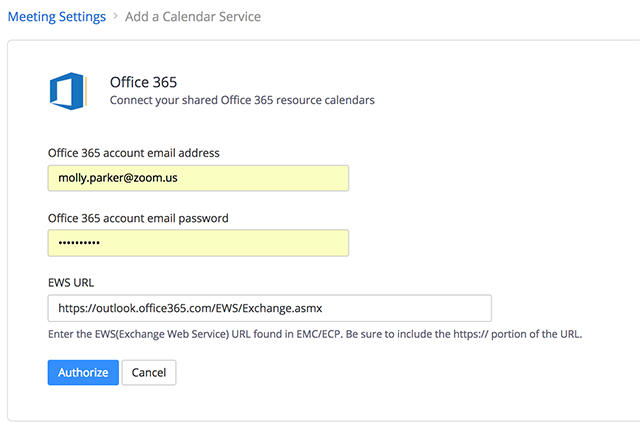 Once you have added a calendar to your Zoom account, Zoom will check your calendar for any upcoming Zoom meetings. The Meetings tab of your Zoom desktop client will show any Zoom meetings found on your calendar for that day. It will only show today’s upcoming Zoom meetings, in addition to any meetings that you have scheduled on your Zoom account, regardless of day. If you hover over a meeting that you have been invited to, it will show a join button. 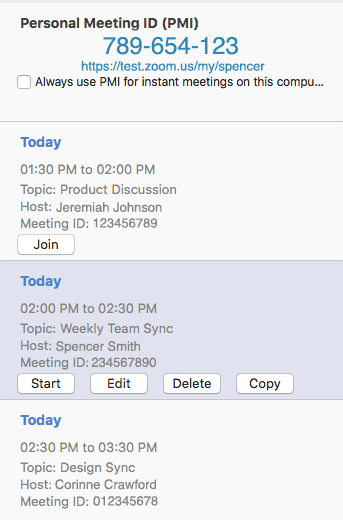 If you hover over a meeting that you are the host of, it will show the Start, Edit, Delete, and Copy buttons. Note: After initially configuring the calendar integration, you will need to sign out of the desktop client and sign in again. Login to your Zoom web portal and navigate to My Meeting Settings. Toggle the Calendar Integration setting to off (gray). This will preserve your integrate calendar, but disable the integration. When you are ready to turn the integration on again, toggle the setting back to on (blue). Your calendar will still be listed. Below Calendar Integration, click Delete next to the calendar name to remove it. Confirm that you would like to delete the calendar integration by clicking Delete.